Crucialfest is returning to Salt Lake and is slated to be bigger and better than ever at their new location, Utah State Fairgrounds. 40 bands from across the country and several from overseas will take this stage at this two-day festival with genres that include varieties of rock, electronic, punk, psyche, and heavy music. 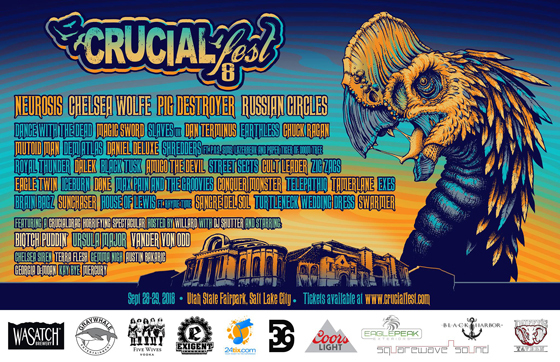 Most notably, Crucialfest will be bringing in headliners PIG DESTROYER, NEUROSIS, CHELSEA WOLF, and RUSSIAN CIRCLES. These award-winning and critically acclaimed bands play sold out shows across the country and have large fan bases eagerly awaiting their next performance. Beyond the music, Crucialfest festival-goers of all ages can enjoy feature themed stages, music market vendors, a food court, VIP areas, beer and alcohol tents and much more. Late night 21+ entertainment includes CrucialDrag, a horror-themed drag show starring Biqtch Puddin’, Vander Von Odd, and Ursula Major, as well as performances from Earthless, Amigo the Devil, Street Sects, Magic Sword, Iceburn, Done, Eagle Twin, and Dan Terminus. Crucialfest will be held Sept. 28-29, 2018 at Utah State Fairgrounds. Tickets, info and band lineup can be found at http://www.crucialfest.com . General passes range from $35-$75. VIP passes ran from $105 – $145 and give fans access to a private lounge with liquor bar, complimentary snacks, Crucialfest swag, express entry at festival gates, express entry to indoor stages, premium viewing at the main stage and unlimited re-entry.